Here’s tips for finding and using Herpes Support Groups that will help you understand and live healthily with the Herpes virus. So you’ve got herpes and you’re feeling lonely and upset about it. What do you do? Join a support group! You’ll feel a lot better if you do. It will help you in so many ways to join a support group and meet other people who have herpes. Meeting other people will make you realize how manageable living with this virus actually is. Normally when you get first diagnosed, you have a lot of questions! Other people in support groups can give you answers. And you’ll get some much needed shoulder to lean on or even cry on. There are lots of options for herpes support groups. Mainly, you can choose between an online support group or an in-person support group. I have used both. Basically an in-person support group is where you go and have a meeting. Some of the meetings are Herpes Social Groups in which the focus is more on having fun. These are great too. You have many choices of groups, especially if you are in the United States, Australia, New Zealand, Canada, or the United Kingdom. There really needs to be some support groups set up in Asia where I am located now. If you’d like to set one up with me, please contact me. 1. Join as soon as possible. Don’t wait. The longer you sit with this virus, the worse you’ll feel, so finding a support group and interacting is a simple little thing, that will make you feel much, much better. Use one of the lists below to help you find a group. 3. Welcome the newcomer. If you've had herpes for a while, then be sure to go welcome the people who have recently been diagnosed, if you know who that is. Those people are going though a hard time and you can really help them out by doing this. 4. Ask a lot of questions. Ask the people you meet how they live with the virus. How do they suppress the virus? How do they give “the talk”. And listen. 5. Have a good time. Laugh. Listen. Have a good time. Get involved in service with the organization. If we all try to contribute to the success of herpes support groups then it will make life sooooooo much easier for those newly diagnosed. And it will add a wonderful fellowship in your life that will add a wonderful new set of relationships. 6. Make friends before looking for romantic partners. You’ll be more attractive to others if you fill your life with friends and fun activities through these groups. If you go just trying to look for romantic partners, you might get a little frustrated. Take your time. Get to know people. 7. Get Social! Be sure to join one of the social groups. Go have some fun with other people. There's really a growing community of people out there turning this diagnosis into positive things in their lives. You can be a part of that! DatingwithHerpes.org has a really good comprehensive list of groups. They include in-person, online, and international groups. This is a good place to start. Hwerks.com has a really good list of local (USA) support groups. They also list national events and roundups where you can go meet hundreds of H people at the same time. In addition, Hwerks is a fun, active dating site in case you’re looking for a new romantic partner. Honeycomb.click is a wonderful Herpes support website and forum with over 60,000 members. You will find support groups here online, in the United States, and internationally. Herpeshomepage.com formerly known as Raccoon.com, one of the oldest herpes sites on the Internet, has a list of support groups also. Herpeshomepage.com has a friendly forum board for herpes also. Here you can post questions and interact with people. They have a special forum for teenagers to help them. PositiveSingles.com is the best herpes dating site on the Internet. They have a good set of forums and blogs that you can use to interact with people and ask questions. My readers have had some good success meeting romantic partners on this website. Honeycomb.click has the largest herpes forum or herpes message board on the Internet. Thousands of people are on here who can help answer questions you might have. They have good resources for teenagers and young people also. Get Social! And feel Better! "Reaching out and simply introducing yourself will help your healing process tremendously." 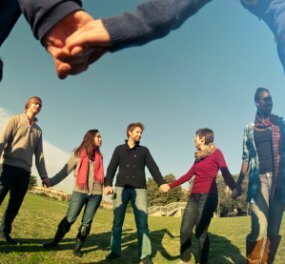 Joining a herpes support group or social group will be one the best things you can do if you have a Herpes diagnosis. You’ll go crazy with worry, fear, and a sense of isolation if you just keep all your feelings to yourself. So reaching out and simply introducing yourself will help your healing process tremendously. I spent many years in the cave of my own fears after getting herpes. Going to my first support group was instrumental in my understanding of this silly little virus and how to live with it. Simply just meeting other people and sharing my feelings helped me so much. It is an experience not to be missed for sure if you have herpes. So do something today, even if it is just to introduce yourself. You’ll feel better. You can help others in the process as well.